Unlike its more refined southern Africa neighbours, Zambia represents the power of raw Africa — from rafting beneath the thundering Victoria Falls to tracking lion on foot in the South Luangwa to canoeing in the Lower Zambezi. Zambia has a well deserved reputation with those looking for Africa unadorned – small personal safari camps and lodges, great food, a variety of luxury and rustic accommodation, rich culture, first-class guides, excellent wildlife, an informal character, and adventurous activities around every corner. Zambia is in many ways like Zimbabwe in its wildlife and wilderness offerings. Famous for its multi-day walking safaris through wildlife-rich national parks, visitors to Zambia can also enjoy day and night game drives in open 4x4 vehicles, boating safaris, canoeing safaris, white water rafting and exciting cultural opportunities. In the hands of highly-trained professional guides Zambia offers the safari enthusiast true wilderness and abundant wildlife. 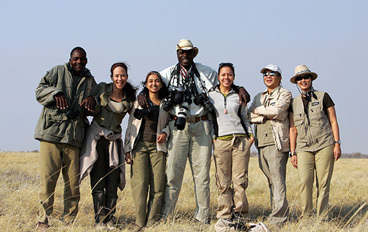 Discover the "Real Africa" in Zambia's premier game viewing regions, led by highly trained guides. This is a country of astonishing experiences, big game, tranquil settings and exhilarating wildlife. This golden safari combines Zambia's iconic game viewing areas in the South Luangwa Valley with Lake Malawi, the world's best fresh water diving and snorkeling.